The nave is where the parishioners were situated in a church during mass, everyone who wasnt clergy essentially. Probably the first thing that would grab most peoples attention is the wall painting and its colour.We are so used to the drab and plain interiors of churches these days, it would quite surprise us just how vibrantly colourful medieval churches were. Most people were illiterate so wall paintings served the dual purpose of beautifying an interior and helping illustrate some of the biblical stories. Its the same with the houses, most were many vibrant colours, it seems the people of the middle ages were quite colourful lot! 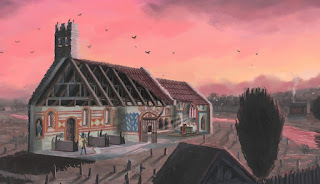 The interior wall painting here is mostly based off Kempley with elements from other churches in Britain like St. Johns the Baptists church in Clayton, Attleborough church in Norfolk, Broughton in Cambs, and copford church in Essex. Most people would have stood in the nave but from excavations there has often been found a small number of seating, most likely for the rich or better off in the community. The seating here is loosely based off ones found in AllSaints, Incklingham, UK. The stoup beside the door is based off one in St. Mullins co. Carlow, this would have been used to baptise babies, these are often found by door, essentially so children were baptised before they entered into the church proper. The statue recess is based off such a recess in Kilfane but could have been a wall press too. Separating the nave from the chancel is the Rood or chancel screen, a partitition that divided the interior space of all churches, this one is based off Barton Turf Church, UK. The roof is Kempleys' roof and it is theorised in England that alot of their churches had ceilings created by the tie beam or bottom collar, instead of open to the roof, which would have been plastered over. The reason for this is that ceilings would have been easier to keep clean, could be even painted on, as the upper parts of the roofs often could be very dirty, full of cobwebs and even bats, so keeping them out of view from below, made alot of sense. The crowning glory of a medieval church was often its chancel window, the one here is a lovely tracery window in the east gable of Killeen, Co. Meath. Many windows in churches would have had glazing or stained glass but others would have just remained open, only to be closed by wooden shutters that could slid into place from the inside. The altar itself is based on one in St. Caimins church, Inis Cealtra, co, Clare. Illustrations from the time show a cross and two candles ontop of a table cloth as alter decorations, as well as wooden board around the base of the alter. Altars are usually found in Ireland to be either against the gable wall or almost abutting it. On either side of the altar are two statue recesses, found in Kilfane church in Kilkenny. The statues throughout the church are loosely based on ones from the middle ages found in Fethard. co. Tipperary and others from Medieval Waterford city. Just above the altar in Kilfane there was a slight rectangular recess, here I inserted alabaster carvings, which have been found in churchyards in Ireland and were probably imported from Nottingham and elsewhere in England. To the left of the altar is the sedilla and the piscina. The piscina is from St. Mullins in Carlow, piscinas were used to wash the holy vessels after the mass. This is the recess closest to the chancel gable on the left wall. Usually besides them were priest seats or sedillas, which are kind of self explanatory, the priests or deacons could rest here in various parts of the mass, this particular double seat is from Kilfane.